Bernie was a gentle man, always generous with his thoughts, feelings, and ideas. He was truly a joy to know. I will forever cherish our mid-day contemplative conversations and his generous mentoring and creative insight. Bernie entered my life serendipitously, but has had an impact that is everlasting. I met Bernie Segal in 2011. He was selling all his stone sculpture equipment in his studio, which was located above The Village Potters at the time. There were tables, carts, tool boxes, and shelving covered with stone dust and showing the wear of many hours of work and passion. He was resigned to quit. Leaning on his cane he explained to me that this decision grieved him, but his body would no longer cooperate with his creative passion. As we laughed and haggled back and forth about prices, I spotted a potter’s wheel in the corner. 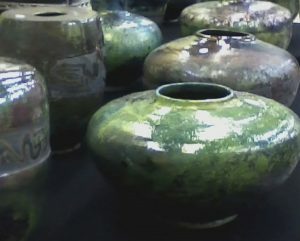 He told me that he had made pots for over 30 years and taught high school pottery for many years in California. So, I casually suggested that when he got to feeling better he should join us downstairs at The Village Potters and make some pots again! He laughed. To my surprise, three months later, Bernie Segal came walking into The Village Potters with his cane. He wanted to join us. We sat down, discussed details, and he openly shared his need for a creative outlet and a connection with creative community. Instantly, a true growing friendship began. Three days each week for about five years Bernie would come to work at the studio with anything from ideas, stories, life lessons for our passions, then he would settle in at his wheel in his small studio space and turn the most wonderful forms. Bernie would laugh, grunt, and sometimes cuss while making pots, but was always fully engaged. If anything was close to impossible – Bernie was intrigued! If the pot was on the edge of collapse then he was having the time of his life. I loved that about him. After about six months of making pots with us at The Village, Bernie got stronger and stronger. One day he came in without his cane, and we never saw it again. Bernie was a man of many talents and interests. He was a master fencer. Many young, serious fencers studied with him. Periodically, a young woman or man would drop by The Village and I would discover that they were his fencing students. Bernie was a natural mentor. He used every area of his work to teach important life lessons. I deeply valued and enjoyed his wisdom. I know that I’m not alone in that, everyone who knew Bernie well loved him. As a young man, Bernie was a drill sergeant. He said that one day he woke up and realized he “could no longer shout in the faces of beautiful, young people”. He resigned from the military and began his life as an artist, teaching young people by using clay as the guide. He loved the medium, clay, but his true love was stone. 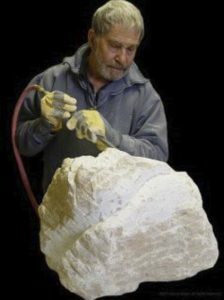 “My aim is to approach each stone with respect for its unique qualities and to bring to each sculpture, my understanding and appreciation of form, my sensitivity to the emotional potential, and my willingness to explore and expose both myself and the stone in the process. Each stone presents a new and separate experience for me.” In the same way Bernie honored the creative process he honored people, and Bernie honored people well. He celebrated the uniqueness of each person around him and he shared himself openly, honestly, and with joy. We cannot speak of Bernie and not speak of his best friend, life partner, and wife, Jeanne. Jeanne was “the love of his life”. He shared stories of their wonderful life together. He always spoke with compassion and caring. They had what I believe is the greatest blessing in life, unconditional and fully realized love. 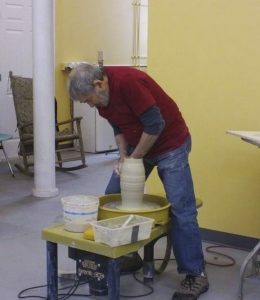 All of us at The Village Potters will always love Bernie Segal, and we will be forever changed by knowing him. He is missed. It is rare to meet a person, for no matter how brief a time, whose words you know you will hear in your head for the rest of your life. But Bernie was one of those people, one of those mentors. He was kind yet brutally honest, a true teacher whose advice held years of experience, experimentation, and wisdom. Someone whose every teaching held meaning that would take years to understand. And someone whose humor and kindness could make you laugh on the worst of days. One of my favorite memories of Bernie: After several weeks of intense work on a figure sculpture, I was so excited to hear that Bernie was at the studio, that I would be able to get a bit of feedback (and possibly even a moment of praise). I had been working so hard to keep in mind the advice he had given me on my last attempt. As he ambled into the room, I heard him grunt. He made his way over, borrowed my tool, and asked if he could make a small change. Within moments he had removed the head. At first I was shocked. But with a few concise words of advice and gruff encouragement, he handed back the tool and walked away. As usual, in the briefest of actions and words, he had taught me a lesson I will keep working at for the rest of my lifetime. We have a tribute collection of Bernie’s work currently on display in our main gallery through July 31st, 2018. Our gallery hours are Monday-Saturday, 10am-6pm and Sunday, 11am-5pm.